I think every weekend in Ramadhan, husband and I did few rounds of tidying up our room. We are still currently staying with my parents. We have the biggest room in the upper level of the house. My two sisters still have their rooms as well even though they have their own place already. But we have two extra rooms for storage; one was actually the smallest room and it belongs to my youngest sister to put her husband work stuffs previously and the other is store room with a lot of old junks. So we cleared the latter room and turned it into our wardrobe room. This project really takes a while to complete! Just because we didn't prepare a budget for it as it was supposed to be a playroom for our kids but we decided otherwise. While I was tidying up our clothes, purged old clothings, I came across an organization video using the Konmari method. The idea is to tidy once and yiu'll be organize forever. 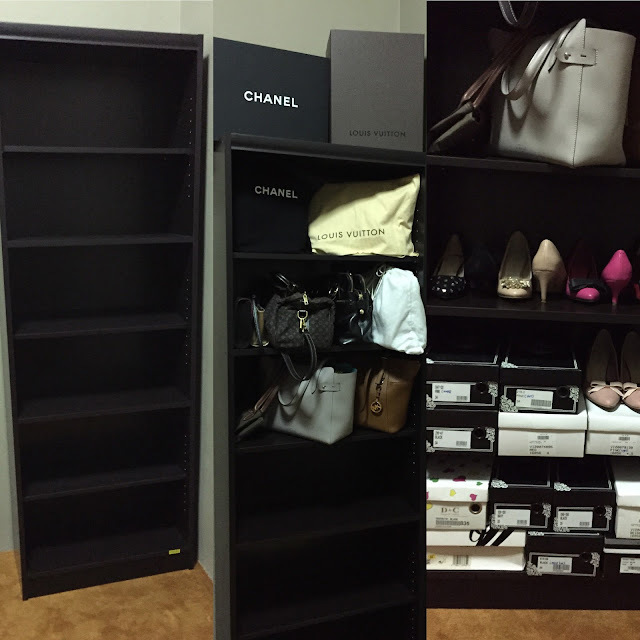 She did her organisation by categories; clothes, books, etc.. But we need to do it in a day, purge all your clothings, take everything out, choose which item sparks joy and those are the items you'll be keeping and throw out or donate the rest. We have done a bit on this one but I'll do another round once our wardrobe is installed. Have to wait another two months for it. Hence for the time being, we'll still be using the lousy rails we bought from Hua Ho Dept Store. I can't wait to actually do the Konmari method. I still have books and makeups especially to organise. I have done on my handbags and shoes (need to buy a new shoe cabinet though!). I'll post pics once we're done. For now, let's enjoy the long Raya holiday. Selamat Hari Raya Maaf Zahir dan Batin everyone!!! You have the book?!! I wanted to buy too but Iman didn't let me. Hehe.. I'll do the organising once our wardrobe installed. Can't waitttt! I actually have extra one, long story - lol! You want? YES! I love this method. Changed my life! Thanks for the post! I can always use help when it comes to organization, haha.